If you’re getting a feeling of déjà vu, that’s because some of this data was released earlier this week by the Pew Research Center, an American think tank organization. It noted that 91 percent of Americans own a cell phone, and thus extrapolated that 57 percent of adults have cell phone with which they access the Internet. 81 percent of cell phone owners send or receive text messages. 60 percent of cell phone owners access the Internet. 52 percent send or receive email. 49 percent get directions, recommendations, or other location-based information. 48 percent listen to music. 21 percent participate in a video call or video chat. 8 percent “check in” or share their location. 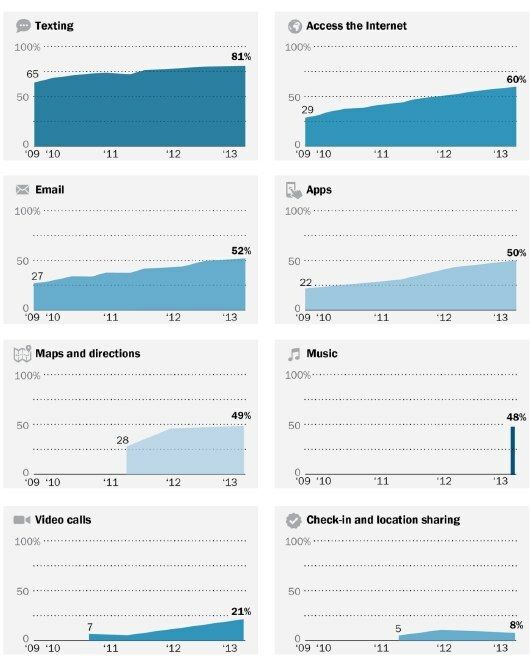 Texting has gone from 65 percent in 2009 to 81 percent today, while email has moved from 27 percent in 2009 to 52 percent today. Downloading apps and Internet use have both more than doubled, going from 22 percent and 29 percent in 2009 to 50 percent and 60 percent today, respectively. Data for the other categories isn’t there yet. Nevertheless, it’s clear video calls has tripled in less than three years while checking-in still isn’t a mass-market activity. The latest results are based on questions asked during telephone interviews conducted in English and Spanish between April 17 and May 19, 2013. The sample consisted of 2,252 adults (age 18 and older). You can read the full 18-page report here: PDF. See also – Pew: 51% of US adults bank online and 32% of cell phone owners in the country do so via mobile and How far mobile phones have come in the past 31 years: It’s infographic time!